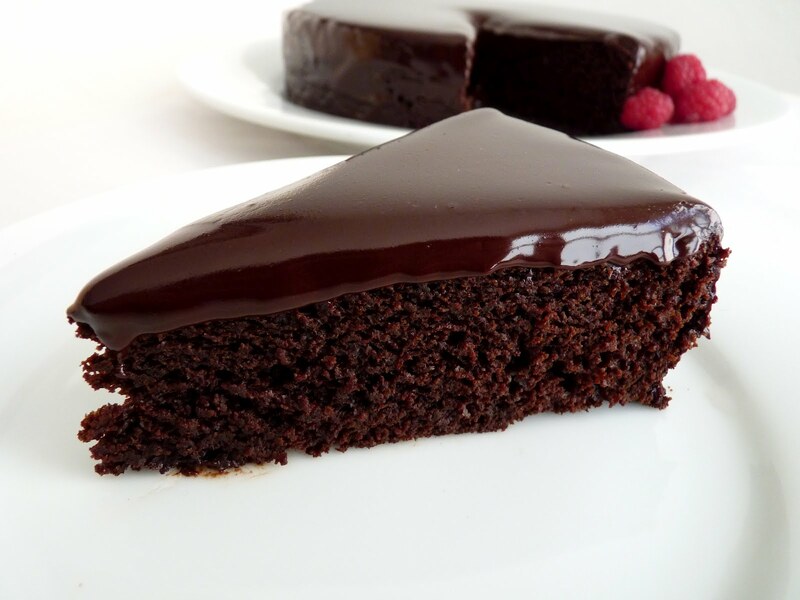 Great idea to scale it down, it made for a decadent single layer cake. I've tried the original recipe, and it's delicious (and massive in size). I've had even better results substituting the oil for softened butter using creaming method instead of sifting the sugar with flour. Thanks for your feedback, Connie. I've wondered about the texture and flavor using butter and using half brown sugar. I'll have to try it. Now that we are "empty-nesters" these scaled-down recipes are so valuable. Thank you again for a lovely post. I love anything chocolate! The glaze/ganache looks scrumptious. Thank you for scaling this down! I also appreciate your notes on the chocolate dough (below) - they're on my list too. I love that last photo, how smooth and shiny the chocolate glaze looks - almost like a mirror! This sounds a really interesting cake, especially with the inclusion of coffee, buttermilk and oil instead of butter. This looks amazing - I'm off to give it a try right now! Howdy, chocolate fans! And here we have Gina, a woman of action! Hope you enjoy every morsel. This sounds like exactly my kind of chocolate cake - lots of lovely cocoa flavour and not too sickly sweet. I often scale down cakes too - with just my boyfriend and I it's hard to get through a whole one if we don't have guests! 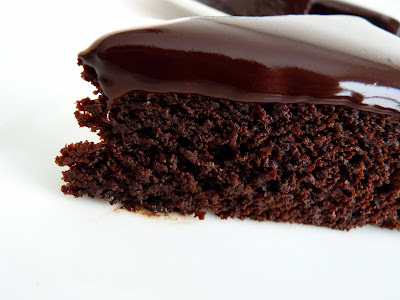 Love the chocolate glaze too - it's so beautifully slick and shiny. Chocolate season beging on January 1 and ends on December 31. This is beautiful. Jan Juicer, yes, I think you have that pegged perfectly. When I saw the first picture of this cake, I literally said "Oh man". It looks amazing, especially with that chocolate glaze on top! Exactly my idea of heavenly food. Love it! This cake looks like it was sent from the heavens above! WOW! Just absolutely beautiful. I would just love to have a plate of this deliciousness. Thanks for the eye candy post! I love your blog. It's simple and elegant. Just plain and simple but says a lot. Great cake recipe! I love chocolates and I'm really ecstatic everytime I see one. Thanks very much and welcome! This cake is a very simple one to bake and the payoff is BIG! 300 degrees per celsius or fahrenheit? Fahrenheit! Thanks for the question and I'll amend the text. Hi, I'm a huge fan of your blog. I just finished making this and I was wondering if you might have some advice. My glaze wasn't thick and shiny like yours but rather very thin. I used heavy whipping cream and light corn syrup in the suggested amounts. Would the kind of chocolate have an effect? If so, could you share what kind you used? Thanks! Hi, Anonymous! Thanks for your question. The glaze is pretty thin so it pours evenly and quickly. It thickens up a bit as it sits. It sounds like you used all the right ingredients. Can you give me any additional detail about what you mean? Did it not adhere to the cake? Did the glaze not have any shine at all? I used Karo brand corn syrup and a 70% bittersweet Callebaut chocolate. The best method for making glaze is to make sure to chop the chocolate as finely as you can so it all melts evenly. Heat the cream and corn syrup to just boiling and then pour it over the chocolate and let the heat penetrate for a minute or so. Then whisk gently in circles - not too fast or you'll cool down the mixture before the chocolate and cream have a chance to fully blend and smooth out. Then just a quick pour onto the cake, focussing on the center so it spreads evenly out toward the edges. Gently rap the sheet pan holding the wire rack against the work surface to encourage the glaze to run evenly down the sides, if necessary. Does that help? Please let me know if you have any further questions! Thank you for this wonderful recipe, I tried it several times and it tastes marvelous! What I like about it is its consistence; it is soft and moist, while previous recipes that I tried were more dry. However, the only thing that does not turn to be the way I expected is the surface of the cake. It turns out to be very porous, even though I usually let the batter sit before baking, so it would lose all the extra air. Nevertheless the surface turns out porous and the glaze disappears into it... I can't make it stick to the cake; the cake just absorbs the ganache and it ends up looking as if there was no glaze at all! Any advice on how to make the surface more "tight"? I don't know what I'm doing wrong, I seem to follow the recipe quite closely. Thanks! Ana, thanks so much for your question. I'm afraid I'm a little stumped. I've never seen anything like this. The only thing I'm wondering about is if you're sure you're using the right amount of leavening - generous 1/2 t baking soda and 1/4 t baking powder (and by "generous" I mean just a bit heaping). And when you say you let the batter sit, how long? Once mixed, cake batter needs to go directly in the oven to make sure the leavening doesn't dissipate. I recommend you just tap the bottom of the pan on your counter a few times to get rid of air bubbles. Do you bake with a standard oven or convection? What does the bottom of the cake look like? Can you simply invert it and try glazing it that way? Hi, love your blog! 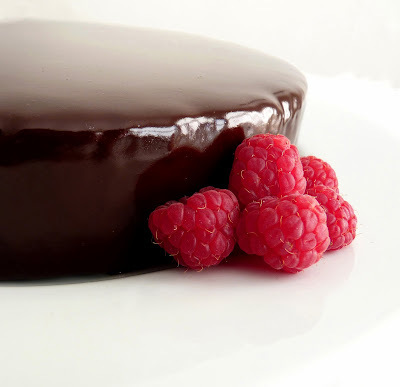 I tried this recipe but the glaze is so thin it's not covering the surface of the cake. Could reducing the amount of the cream help? Also, I'm having the crackling on the top of the cake. But it does taste good! Thanks! Thank you very much, terya! Sorry to hear about your cake cracking troubles. Did you bake the cake in an 8" cake pan in the center of the oven? One of the symptoms of cracked cakes is an oven temperature that is too high, causing the cake to rise too fast. This cake bakes at a very low temperature. So you may want to be sure your oven is calibrated and if you don't have an oven thermometer, you may want to get one to be able to read the temperature accurately. Finely chop chocolate. Bring cream, sugar, and corn syrup to a boil over moderately low heat, whisking until sugar is dissolved. Remove pan from heat and add chocolate, whisking until chocolate is melted. Cut butter into pieces and add to frosting, whisking until smooth. 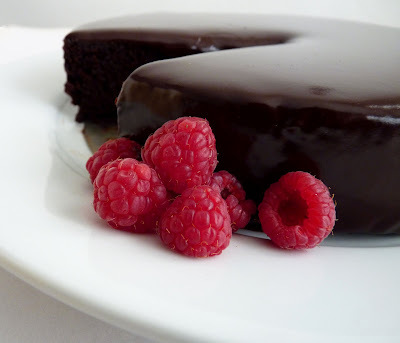 Transfer frosting to a bowl and cool, stirring occasionally, until spreadable (depending on chocolate used, it may be necessary to chill frosting to spreadable consistency). Spread frosting between cake layers and over top and sides. I hope this helps you in your enjoyment of this cake! Can we turn this into cupcakes? ?and if yes how much time should i give them to bake??? Sid Twix, these make great cupcakes. Bake them for about 22- 25 minutes.